Before I actually talk about the final performance, it might be a good idea if I tell you what happened before it all. Ithink I’ll start from Monday because nothing else really happened upuntil then. Basically, we had a dress rehearsal, and guess what! Ourmain star was sent home ill, so she wasn’t in the rehearsal. Tuesday and Wednesday lunchtimes, we did some more run throughs justto know everything. Josie (Who played Auntie Morgan) was so excited(she knew her lines off by heart) that she started singing her linesand doing some dancing to them. She kind of does that sort of thingwhen she’s hyper, that’s just her. Even though everything was goingfine, I still felt as if we weren’t ready. But thinking back, duringevery performance I’ve ever given in my 15 and a half years, I’vealways felt like that, I guess that’s just me. Oh, and I nearly had amini heart attack when I thought the music had gone missing! But turnsout it was in school. Phew. The night finally arrived and as Iwas getting ready at home, I thought to myself “Just remember tobreathe and I’ll be fine”. We all arrived at school at 6pm to sort outprops, music, lighting,etc. We were all being idiots in the music suiteAKA our dressing room and when the helium balloons arrived for my play,people were obsessed with trying to play with them. nutters. We gottold off a few times because we were too loud and apparently “Theaudience could hear us” which is basically an excuse to shut us up sothe teachers could think straight. I tried taking pictures of my cast,but they kept on wandering everywhere so I couldn’t get them all intoone picture. At 7 o’clock, we were lined up in two straight lines(which automatically reminded me of the film ‘Madeline’) and we werequietly lead into the drama hall to take our seats on thenot-so-very-comfy benches. Then the plays began. 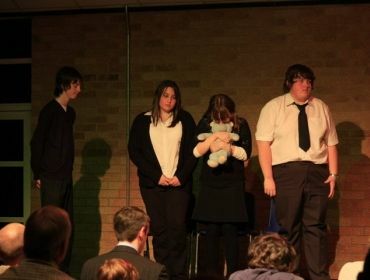 Year 8 went first witha play about the ‘right decision’ which was really funny but also sentout a really good message. 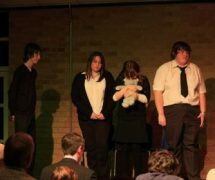 Next there were two plays from yearnine. The first one was called ‘That’s What Friends are For’ which isabout a girl named Christy and how she wishes she was rich instead ofhaving her amazing friends, but it doesn’t turn out how she wanted whenthe wish comes true. The second play was called ‘Touching The Past’which was all about a girl who moves to a new town and embarks on amission to discover the secrets and lies at the heart of her new home’spast. 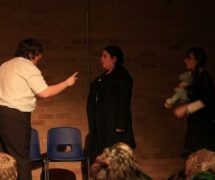 Then there were three year 10 plays. The first one wascalled ‘You Must Remember This’ which was about a woman looking back onher life during World War II and the bombings in Cwmparc. I liked thisone a lot because in Primary, I worked on the Cwmparc Memorial for thebombings so I knew what it was all about. The second play was called’She’s Leaving Home’ which starred David.Evans. It was about a girlcalled Tash who was running away from home and her problems and peopleconvince her to go home. Finally, my play was up, ‘Lost Love’. Iwas really nervous. 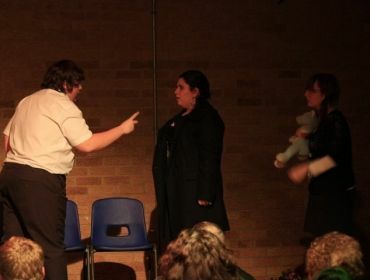 Halfway through the play as I was saying a speechat the Wake, I got distracted because a certain Callum.Jenkins was inthe wings trying to signal to me to be louder so I stared to stutter alittle. Also, at the beginning of that scene, the music didn’t start soJosie and Jess (who played a woman) started singing the song anyway!The rest went smoothly until Callum.Jenkins let go of one of theballoons and it went up to the ceiling, he still acted in characterwhen he said “Oh… one of them blew away!” so at least he kept hiscool! After the play we had a little break while the judges (oneof which stars in ‘Pobl-y-Cwm’… I don’t think any of us knew who hewas as we don’t watch the show because we can’t understand Welsh allthat well) decided on who to give awards to. I went and spoke to myfamily. My dad was blubbering like a baby, I thought it was because myplay actually touched him, but he was just emotional because I was onstage. He’s like that. 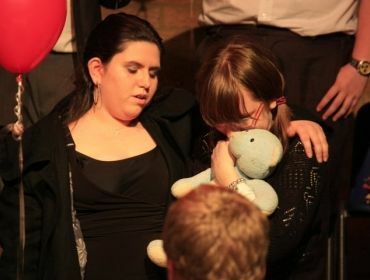 He cried once when I was only on stage for likea second, but I guess he’s just proud of me! 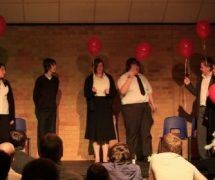 My cast and I also bit theballoons and sucked the helium out of them to talk in high voices for alaugh. 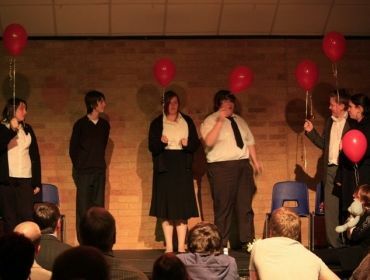 It was also funny to watch the two sixth formers give each otherpiggy backs to try and reach the balloons. 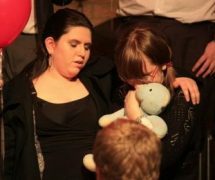 Once we had finishedbeing silly buggers, we were seated again and awards were given out.Our play didn’t receive any but I don’t really care. For one, it was anachievement to get from the 30 plays into the final six and secondly, Ionly cared about pleasing the people I wanted to please, which I thinkI did. All in all, it was a good night. I’m glad it’s over now, though, so I don’t have anymore stress. I’dlike to thank Frank Vickery for the workshop we had, the staff fororganising it, the judges, the audience and most importantly, my castfor helping me through it all.